Modern styling and functionality combine in this sleek, silver desktop calculator from Sharp. A large, tilted 8-digit display and colourful plastic keypad make this a sturdy and attractive addition to your desktop. Dual powered to save on energy use, it includes an automatic shutdown feature which turns the calculator off after 7 minutes of disuse. 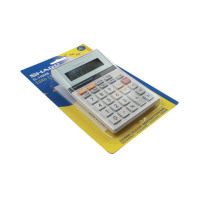 With nifty features like the currency converter, 4 key memory and tax calculator functions, the EL-330ERB is a great choice for everyday calculations.